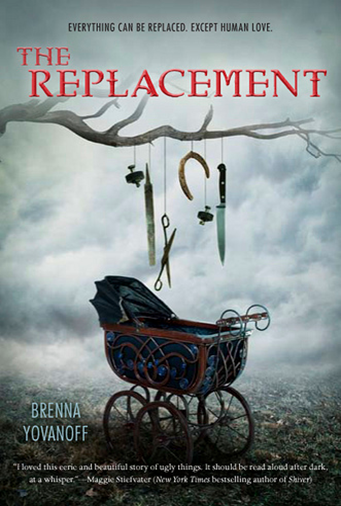 THE REPLACEMENT, Brenna Yovanoff's 2010 debut is one of our favorite reads for 2010. (Check out Alyssa's REVIEW!) Thanks to Brenna Yovanoff and Teen Book Scene for including us in the tour! Today we have an excerpt, some of our favorite lines from the book, and a giveaway! "Tate took a deep breath and stared up at me. "It wasn't her." For a second, I didn't say anything. Neither of us did. But we didn't look away from each other. I could see flecks of green and gold in her eyes and tine spots so deep and cool they looked purple. I realized that I had'nt really looked at her in years. She closed her eyes and moved her lips before she spoke, like she was practicing the words. "It wasn't my sister in that box, it was something else. I know my sister, and whatever died in that crib, it wasn't her." I nodded. I was cold suddenly, goose bumps coming up on my arms in a way that had nothing to do with the rain. My hands tingled and started to go numb. ...I hadn't given away my secret because I didn't even know how to say the secret out loud. No one did. Instead, they hung on to the lie that the kids who died were actually their kids and not just convincing replacements. That way, they never had to ask what had happened to the real ones. I had never asked what happened to the real ones. That was the code of the town - you didn't talk about it, you didn't ask. But Tate had asked anyway. She'd had the guts to say what everyone else was thinking - that her true, real sister had been replaced by something eerie and wrong. Even my own family had never been honest enough to come right and say that. Tate had made herself a loner and an outcast when I was the one who was supposed to be the freak. I'd shied away like she might infect me, but she was just a girl trying to get a straight answer from the most obvious source. And yes, I was obvious. When it came down to basic facts, I was weird and unnatural, and the game only worked as long as everyone else agreed not to see. If you took all the kids in school and lined them up, it was clear that I was the one who didn't belong. I was the disease. He answered on the first ring, sounding easy and cheerful. "What's up? Are you calling to wish me luck in my quest to rescue Stephanie from the tyranny of clothing?" "Is it okay if I come with you?" "Yeah, that's fine. Not the the clothing thing, though, right? I mean, that's kind of a one-man job." Danny shoved the the glass across the counter at Drew. "Try that and tell me what it needs." Drew took a sip, then coughed and set the glass down. "That's awful." Danny scowled and tossed a dripping tablespoon at him. "Your're awful. I'm looking for constructive feedback. What does it need?" Drew threw the tablespoon back. "It needs to be taken out and shot." THE REPLACEMENT will give you goosebumps and make you laugh and cry. It's an eerie tale but full of endearing relationships and themes of unconditional love and acceptance. And we have one copy up for grabs! I just bought this one online a few minutes ago. Can't wait for it to arrive. Even more so now I've read your review. SB - hope you enjoy the book! Katie Doll - Thanks for letting us know the link was messed up! sRy - Thanks for providing the link! Everyone: Sorry for the technical bug. The link is working now but if you have any problems just let us know! Thanks for the giveaway.I can't wait to read this one. This sounds like a great read for Halloween! I especially love the creepy cover! I cant wait to read this book! Thanks! Thanks for providing an excerpt and holding this giveaway! I've heard a lot of good things about this book but I've yet to read it. I did not think this would be an endearing read at all- it actually initially struck me as sort of creepy! But after reading the excerpt you provided, I'm so much more excited to read it. Thank you for the giveaway! This book sounds so good Great giveaway thank you very much! This book sounds great! Can't wait to read it. This cover sent chills down my spine the first time I saw it. I immediately had the movie "Rosemary's Baby" pop in my head and again I was chilled. Congrats alyssa. Its nice to see that your hard work is paying off. We need more good authors! I am an advocate for illiteracy. I win books and give them to the local highschool. They have no funds for books. Again COngrats! JAMIE: This book seems so exciting! This is one book I can't wait to read, at least Christmas is close. great giveaway! Thanks for hosting. I want this book so so so bad! Oooh! I want it soo bad! Great giveaway!!! Haha, this book could give me nightmares, but I'm really tempted to read it :) Thanks for the giveaway! "Goosebumps up the arms"- the cover alone does that. This book sounds so good. It is now on my must read list. I just discovered your blog and it looks really interesting! I'm really excited to read this book! Thanks for the giveaway! Sounds suitably creepy! Please count me in. Thanks for the giveaway! Definately want to read the book, superb review!